While construction of a new lift to carry skiers out of the traditionally “hike only” Teocalli Bowl at Crested Butte Mountain Resort (CBMR) may not carry a significant environmental impact, the resulting additional influx of skiers traversing the mountain could be of concern, according to the U.S. Forest Service. The Forest Service just released an environmental assessment for Crested Butte Mountain Resort’s Main Mountain Improvements Plan and is seeking comments from the public. CBMR’s Main Mountain Improvements Plan calls for a multi-million dollar overhaul of the existing ski area that includes new lifts, new terrain and more snowmaking. The Forest Service is required to form an environmental analysis of any ski area improvements on Forest Service land per the National Environmental Policy Act (NEPA). The plan does not include the resort’s proposed expansion onto neighboring Snodgrass Mountain. According to Gunnison National Forest public affairs specialist Lee Ann Loupe, a 30-day public comment period will begin this week, following a public notification published in the Grand Junction Daily Sentinel on November 14. The Forest Service will then review comments and make changes to the environmental assessment before approving CBMR’s plan. “It’s a routine analysis, but because it involves a ski area it’s also high in public interest,” Loupe says. According to High Country Citizens’ Alliance public lands director Dan Morse, CBMR’s plan is nothing out of the ordinary, but it is more comprehensive than usual. “The Forest Service requires ski areas to provide periodic planning updates for improvements in existing ski area boundaries,” Morse says. CBMR unveiled its master plan to the public in November 2005. CBMR general manager Randy Barrett says the improvements plan “is kind of an overall vision for the build out of the main mountain.” He says instead of asking the Forest Service for permission each time an improvement is proposed, the new document should cover several years’ worth of improvements in one fell swoop. However, Barrett says, any significant changes to the plan would require more analysis. According to Barrett, the plan includes the aforementioned Teocalli Bowl lift, new high speed lifts for Painter Boy and Gold Link, the addition of gondola cars on the Red Lady Express, 40 acres of new snowmaking, and 50 acres of new and expanded terrain. In addition, the plan outlines the relocation of the ski patrol headquarters to the top of the Silver Queen lift, an expansion of the Ice Bar, and several improvements related to the proposed Red Lady Lodge (which has already been approved). Barrett says the resort is still on track for beginning these improvements next summer. It will take five to seven years to complete the improvements at a cost of more than $50 million, according to the plan, but Barrett says the price is always changing. The Forest Service assessment lists a number of areas that could be impacted by the improvements, such as disturbances to wetlands, increased erosion, impacts to visual resources, increased water runoff, potential geologic hazards, and impacts to wildlife. Deer, lynx, and sage grouse were not identified as species that could be affected. None of the associated impacts are identified as being significantly detrimental to the environment or safety of ski guests. However, the Forest Service is taking a close look at the ski area’s capacity. “Like most ski area improvements, the (Mountain Improvements Plan) is projected to increase CBMR’s capacity, and that raises potential issues in both administrative and environmental terms,” the analysis states. CBMR’s plan states that the resort can currently handle 6,782 skiers per day; improvements would increase that number to 10,134 skiers. The environmental assessment is available online at www.fs.fed.us/r2/gmug/policy/ under the “recreation/ski areas” tab. 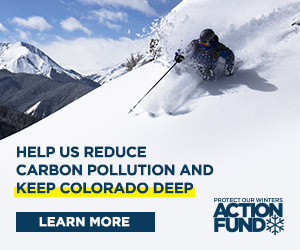 Comments can be sent to Crested Butte MIP, U.S.F.S., 2250 Highway 50, Delta, CO, 81416; fax to (970)-874-6698; or email comments-rocky-mountain-gmug@fs.fed.us.